It was almost inevitable, during the period when Donna was sculpting her memorial to Princess, that Meg and Esther would become friends. They continued to enjoy each other’s company throughout their childhoods, but it was not until a Girl Scout outing at a rustic, scout-owned site in Forsythia Forest that they became best friends. An accident sealed their bond. Meg, observing the collapse of a campfire that had been injudiciously built on an incline, instinctively grabbed at a burning log, fearing that it would roll toward a sleeping bag in its path and cause a forest fire. She caught it with the palms of both hands, and threw it back onto the fire before anything else could ignite. After being treated at a local hospital for burns, she came home with hands so heavily bandaged that she could not turn a page or hold a book. Meg could not live without a constant stream of words flowing from a printed page. To comfort and entertain her inured friend, Esther began to read aloud in much the same way that Meg’s mother had once read aloud from Ethan’s Best Friend. 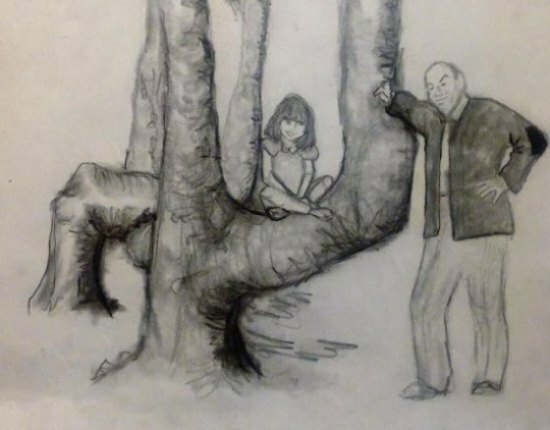 She did this while they were nestled in my branches – Meg’s hands being useless, Esther had to hoist her up – which means that I got to listen to all of the stories. The two girls’ friendship survived adolescence, continued to grow, and thrived during their turbulent years as young adults. They remain friends to this day, and still spend long hours every week with me and my fellow trees. Esther, in fact, met the man that she would fall in love with in our park. And Meg never would have fallen in love at all, if Esther hadn’t resumed her old habit of reading aloud. But before I talk about that, I want to tell you a few new things about the Swerling family, and remind you that Sam and Ghita raised their children in a sprawling penthouse apartment on the seventh floor of The Darlington Building, across the street from Sam’s park. Esther’s family also lived in the Darlington, in a three-bedroom apartment on the fifth floor. Esther loved living two floors below her grandparents. Sam loved working in the same building where he lived. When his children were young, and despite the early success of his inventions, he worked exclusively at a large table in his breakfast nook. Since the tools of his trade were no more sophisticated than a sketch pad, a number two pencil, a clipboard, several rulers, and a double-hinged compass, that was all the space he needed. Sam typed his business correspondence on an Underwood Deluxe portable typewriter, and he made all of his business calls on the family telephone when the children were at school. In a little room off the master bedroom, barely big enough for two metal file cabinets, a desk, and a phone, Ghita kept all the ledgers, paid all the bills, and did all of the company’s bookkeeping. space. Not much more space. But more than could be provided by a larger table in a breakfast nook. The second thing that happened was Honor, his oldest daughter, going off to college. Which meant that Honor’s bedroom was empty. So, Sam moved in and turned it into a real office. He furnished it with six large filing cabinets, a private telephone with two lines, a photocopy machine, a huge drafting table, a fax machine, a bookcase, and three desks. He had found the desks in a second-hand warehouse across the river, and he fell in love with all three. They were old fashioned oak monstrosities, of which, he took the largest as his own. He gave a slightly smaller desk to Ghita for her bookkeeping; and he set aside the third desk for the use of his protégé, even though he had no idea whom that person would turn out to be. Sam believed that with five children, three nephews, and innumerable grandchildren, one or more of them would grow up to be an inventor. At least, that was his hope. For many, many years, though, the desk that Sam had so optimistically purchased for an acolyte remained empty. If you ask any parent which is his or her favorite child, they will inevitably respond that they do not have a favorite, and they love all of their children equally. Grandparents, however, are not bound by such diplomacy, and despite frequent denials to the contrary, they do, indeed, have favorites. But Sam more than loved Esther. He adored her. From the day that she started to crawl, she was following him around. Sam called Esther his nightingale, his skylark, his sparrow, his prairie flower, and his Morning Star. She was the child of his heart. The embodiment of his soul. When he thought about her, he patted the seat beside himself, as if inviting her to sit down, even when she wasn’t there. When he looked at her, he wanted to laugh. At seventy-two years of age, Sam had finally found a sidekick. Esther was Robin to his Batman, Tonto to his Lone Ranger, and the indispensable Watson to his Sherlock Holmes. As for Esther, she loved her mother, she loved her father, she loved her siblings, and she loved her grandmother. But her grandfather was her hero. If a religious school instructor had asked her what God looked like, Esther would have described Samuel Swerling. All throughout her elementary and high school years, Esther went to Sam’s office after school. She was not allowed to tinker with spools, springs, coils, nuts, bolts, wires, dials, tubes, bulbs, bells, or switches until she had finished her homework, which she did quickly and in as slipshod a manner as she could get away with. If she got a higher grade, she would have considered it a miracle. 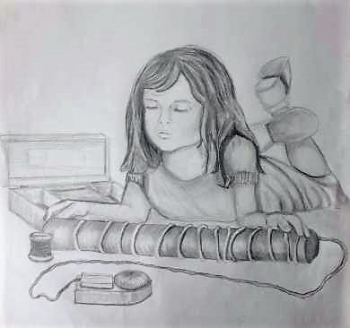 Only when her homework was done was Esther allowed to tinker with Sam’s inventions. Oh, they had jovial times together, Sam and his granddaughter. Esther had a wonderful childhood. I already mentioned that she designed the system that Sam installed in the park to block signals from computers, satellites and cell phones. Until now, however, I did not tell you that she designed it when she was thirteen years old. Simple inventions, like booties to help owners soak their injured pets’ paws in Epsom Salt; spiked plant strips to dissuade squirrels from digging in flower gardens; and padded pet-grabbers for snatching cats out of trees and puppies from behind the stove. Sophisticated inventions, like sonar bird warning systems for wind turbines, and car sensors that emit loud alarms if a pet or a child is left unattended in a car. During her last year of high school, Esther’s test scores were so high that, despite mediocre grades, she was accepted at a respectable university. This delighted her parents, because they believed that on a college campus and away from Sam, she would focus on her studies and finally get a proper education. They happily drove Esther to her new dorm, introduced themselves to Iris, her roommate, took both girls out to dinner, wished them good luck, and then drove off into the sunset. Esther’s mother’s voice was anguished. “But…” Her mother tried to interject. Esther was not to be interrupted. A week later, she was working for her grandfather. Finally…finally, the empty desk in Samuel Swerling’s office was occupied. To that long-neglected but much cherished ancient oak monstrosity, Sam allocated his favorite grandchild and his only protégé. Within a month after her first day at work, Esther was earning a reasonable salary, renting a studio apartment three blocks from The Darlington, and commuting to work. Samuel Swerling was a happy man. Copyright © 2017, Shelly Reuben Originally published in The Evening Sun, Norwich, NY - evesun.com Shelly Reuben’s books have been nominated for Edgar, Prometheus, and Falcon awards. For more about her work, visit www.shellyreuben.com.